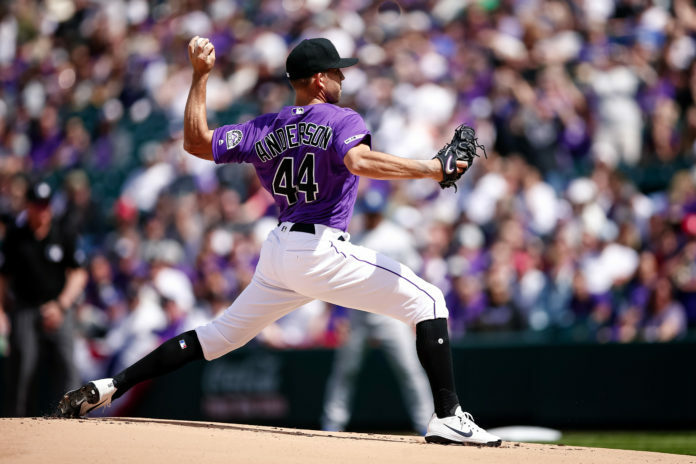 The Colorado Rockies announced Sunday that left-handed pitcher Tyler Anderson has been placed on the 10-day injured list with left knee inflammation. Yency Almonte was recalled from Triple-A Albuquerque in correspondence with the move. His latest addition to the injured list will be his third for left knee inflammation in his career. Anderson is 0-2 this season with a 7.71 earned run average for the Rockies. 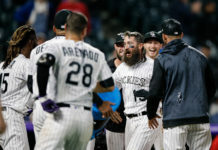 The 29-year-old was shelled in his home opening start against the Los Angeles Dodgers, departing with a line of four innings pitched, allowing six runs off nine hits and three walks. He was scheduled to pitch the final game of the Rockies’ upcoming series, hosting the Atlanta Braves. Anderson is the latest casualty to the injury bug in 2019, joining teammates Ryan McMahon and Daniel Murphy on the shelf. Pitchers Chris Rusin and Antonio Senzatela are also working their way back from injury and have yet to play in the big leagues this season. Almonte, 24, has bounced around between the minors and big leagues last season and posted an ERA of 1.84 in 14.2 innings pitched. He registered 14 strikeouts last season for the Rockies as a relief pitcher. Almonte was groomed through the Rockies farm system as a starting pitcher but was converted to a reliever at the start of last year. 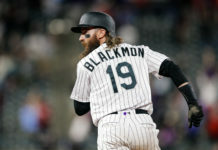 Due to his experience as a starter, Almonte could make a spot start in place of Anderson, although it is reasonable to believe the club may look elsewhere for the start with Jeff Hoffman and Peter Lambert in waiting. Senzatela has also gotten to the point where he could throw “75-80” pitches confidently if called upon according to Manager Bud Black. Lambert would need to be added to the 40-man roster, but with two open spots, the move would be merely a formality. He is currently on schedule for the start if called upon. Speaking to media before the final game of a three-game set with the Dodgers, Black did make it clear that a bullpen game is out of the question. The Rockies are off to a slow start, posting a record of 3-6 through the first handful of games this season. Until this point, the starting rotation was the one aspect of the club that had avoided injury.